Karen and i visited Wasabi in Downtown Minneapolis on a Saturday night. You know, say what you will about Wasabi; a lot of people i talk to don't seem to like it much. I love it, though, with the exception of nearly impossible and/or extremely expensive parking. 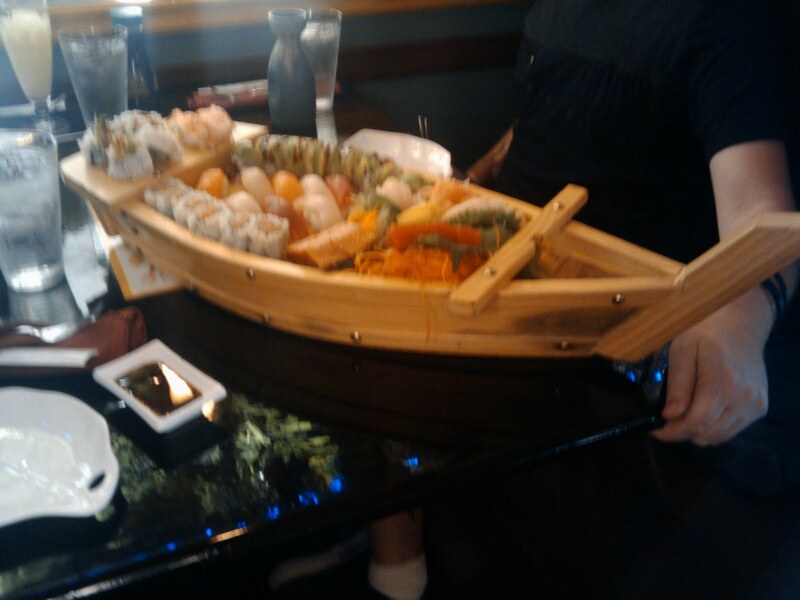 Whenever i'm there with three or more people, i always recommend the Treasure Boat, although the last time i was there it left a little to be desired. I wish i could say why specifically - it just wasn't as fabulous as it usually was for some intangible reason. I guess that's why i'm not a food critic. Yet. Anyway, Karen and i got a small selection of sushi, thinking we would order more in a bit: the Rainbow Roll and the Volcano Roll, as well as some drinks. I got my Wasabi standard: the Drunken Samurai, which is a dazzling green blend of rum, coconut, cream, Midori, and ...and other stuff. Good stuff. The Rainbow Roll was okay, nothing to write home -- or blog -- about. Pretty, plain, bland. The Volcano, however, was just awesome, and try as we might, we didn't have room for anything more once we had finished it. Hopefully next time I can get a good picture of it, because it's really quite impressive, complete with actual fire. Gothic for Goths: Lesson 6, coming soon!